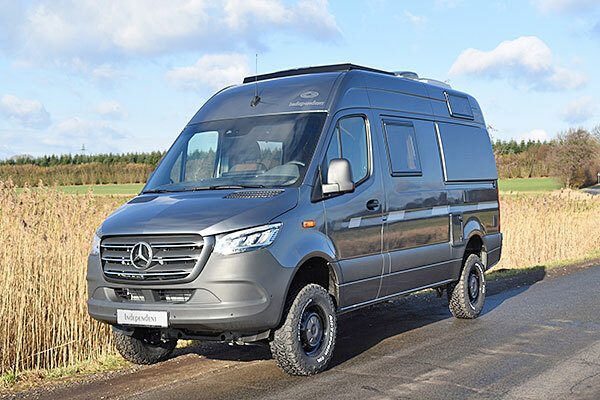 The CS Independent is based on the Mercedes Sprinter with 3.665 mm wheelbase, making it 5.91 m lang. Part of the lndependents standard equipment is a four-wheel drive that can be switched on and oft at any time. This four-wheel drive entails an uplift of the vehicle to an overall height of 2.820 mm. Two different engine types areaffered- each with Euro 6. The first one is a 4 cylinder, 120 kW /163 HP engine and the other one is a 6-cylinder engine with 140 kW I 190 HP. Both come with a standard 6-gear-transmission, and can optionally be equipped with an automatic gearbox. Essential safety equipment like a new generation of ESP, ABS, TCR, Crosswind Assist and driver/passenger airbags are just as much standard as a remote controlled central Ieeking system, electric windows and heated electrical side mirrors as weil as heat insulated glass in the driver's cabin. The Iist of further optional equipment is lang and ranges from reduction gear to Xenon headlights.The gross vehicle weight is 3.500 kg. The four-wheel drive of our Independent is based on the regular rear wheel drive. A lengthways automatic transfer gear is installed on the front axle to handlethepower transition. When activated the driving power will be split between the front and back axle. 35% of the power is used by the front axle and 65% by the rear axle. Differential, front axle, back axle and lengthways differential cannot be blocked. The ESP has been upgraded with an electronic friction system - called 4ETS - to prevent only one wheel being powered under bad conditions. By braking individual wheels the system manages equal power on all wheels and prevents wheels from spinning. As a result the system offers effective torward movement even on loose ground, such as sand. The optional reduction gear reduces the transition strain on all components by ca. 40 % and provides each wheel with more movement power. The CS Independent was designed for those customers who want to be as independent as possible. Forthis reason the Independent not only comes with standard four-wheel drivethat allows driving off-road but also offers independence from fluid gas. The vehicle does not lose any comfort even without a gas system. Both heating and warm water supply are produced by a Truma diesel boiler/heater device. With 6000 W the interior will generally never get cold. The water heater heats up to ten Iiters to 60 oc very quickly. The elaborate diesel ceramic cooking areaisnot only easy to maintain but also allows cooking without need for gas. The kitchen area with additional overhead Ieckers contains the diesel ceramic cooker, a stainless steel sink, spacious drawers, a foldable working area extension as weil as further cupboards. To reduce the power consumption we almost exclusively use LED-Iights with a maximum power rate of 2 W each. Our standard 90 I fridge shines with excellent isolation and correspondingly low power consumption. The Iayout of the Independent is almost similar to our popular Rondo with the large fix bed in the rear of the vehicle being its main feature. We reach a length of 1.95 m and a width of 1.42 m thanks to custom made body enlargements. Even with these enlargements the vehicle is only 2.02 m wide and fully suitable for dailyuse. The bed comes with a slatted frame and an MDI- cold foam mattress. Below the rear bed is a very large cargo area which is not obstructed by gas bottles.lt has a volume of more than 1.000 I. Connected to the rear bed, on the right side of the vehicle, is the wardrobe, offering ample space. Below it, an extra step for easy access to the bed can be pulled out. The seating area consists of the swiveling driver's cabin seats as weil as a bench for one or two passengers allowing for up to four seats. lt is also possible to add an optional vario-bench which can be unfolded to another bed, measuring 185 cm x 90 cm. Overhead lockers with plenty of space can be found above the driver's cabin, the seating area and all around the rear bed. The movable sink in the wet room allows fitting cassette toilet, shower and Iavatory on relatively small space. The freshwater tank can take up to 100 I. This volume can be increased by adding further tanks. The waste-water tank is located underfloor and can take up to 90 I. The 12 Von-board electric system comes with a 235 Ah gel-battery which is charged via the on-board charger (30 A), the vehicles dynamo and also the standardsolar panel (160 W). This installation allows long Iasting power supply even without external power source. The vehicles' interior is weil ventilated thanks to multiple windows and roof hatches. All windows and roof hatches come equipped with insulated glass, a mosquito net and blinds. The entire vehicle is insulated with 20 mm X-Treme insulator and poplar plywood. Both are of highest quality. Furniture is constructed exclusively out of 15 mm HPL-Iaminated poplar plywood or even with a real wood veneer being optionally available. Most of our furniture edges are made with solid wood. Many small details like the bottle- or newspaper rack make each vehicle unique. We offer a wide range of different possibilities, since every vehicle leaving our production is made individually for our customers. Be it material selection or many different optional parts, such as a digital satellite system, flat screen monitors as weil as an oven, a microwave or an inverter. Alltheseoptions create a one of a kind vehicle of the highest quality.